Race Winner: Spencer Gallagher of GMS Racing (Chevrolet) in overtime. ● Ran midpack most of the stage and the field split into two single-file groups. ● Told crew his car was “scary” loose as he navigated the Talladega high banks. ● Stage ran without caution as Briscoe experimented with moves he might employ later in the race. 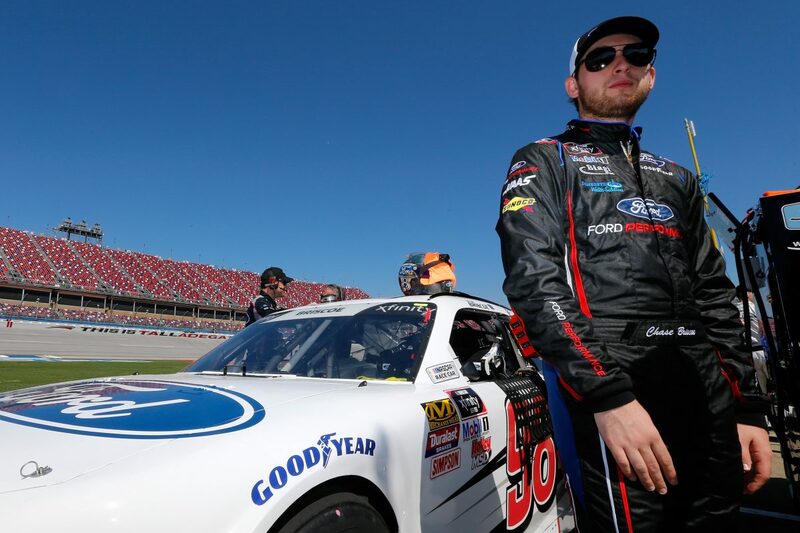 ● Briscoe started 20th and finished 19th. ● Ran just ahead of several cars involved in a multi-car wreck on lap 32. ● Moved as high as 15th during the stage. ● Briscoe dropped back to 22nd field after crew told him to do whatever he needed to do to make sure he kept the car intact to battle for the victory at race’s end. ● Briscoe said the car’s handling was “way better” in that stage. ● A two-tire stop on lap 53 after Stage 2 break bumped Briscoe up to 14th for the start of the final stage. ● Moved into the top-10 in the opening laps of the final stage. ● Briscoe made a scheduled, green flag pit stop with 37 laps remaining. Most of the field took two tires, but Briscoe was forced into taking four after flat-spotting his old tires on the stop. ● Briscoe lost a lap to the leaders he could not regain until a caution that sent the race to overtime. After returning to the lead lap, Briscoe started overtime in 11th and finished 16th. ● Saturday’s race marked Briscoe’s fifth career NASCAR Xfinity Series start and second at Stewart-Haas Racing with Biagi-DenBeste (SHR). He’ll run three more races with SHR in 2018. ● Five cautions slowed the race for 29 laps with only 19 of the 40 drivers finishing on the lead lap. ● Spencer Gallagher led only one lap, but it was the final lap andhe won the Sparks Energy 300 to score his first career Xfinity Series victory. His margin of victory over second-place Brandon Jones was .152 seconds.